Sir – Traditional owners have used their rent income from the Finke Gorge National Park to put two mobile phone hotspots, developed by the Centre for Appropriate Technology, along the notorious Boggy Hole access track to the park. Last year they raised with the Central Land Council’s community development unit their longstanding concerns about being unequipped to rescue bogged visitors. The CLC helped them make a plan to fund emergency phone access. CAT’s hotspots capture signals from mobile phone towers and amplify them to a usable level, extending mobile coverage into areas where previously there was none. It helps tourists and other people call for help when they get bogged. It’s keeping them safe and giving us privacy and less worry. Not knocking on our door calling for help at night in languages we don’t know. Of all the things the traditional owners could have spent their collective rent money on they decided to prioritise a project that helps the wider community. It’s a win-win. The CLC’s community development program asked CAT if it could test the feasibility of deploying the mobile hotspot technology along the Boggy Hole 4WD track. CAT combined knowledge of satellite antenna and mobile technologies to create the hotspot, and has also developed a mobile survey rig for field testing. The key with the hotspot is knowing where to locate it. In some places there is simply no mobile signal. In others, there is a signal but it is too tiny for a hand-held phone to work and this is where the mobile hotspot comes in. After traditional owners helped CAT to survey and choose suitable sites they decided to spend some of their rent money on the hotspots, a shade structure and signs about the location of the hotspots. The hotspot is rugged, reliable and needs no power, no solar panels and no maintenance. 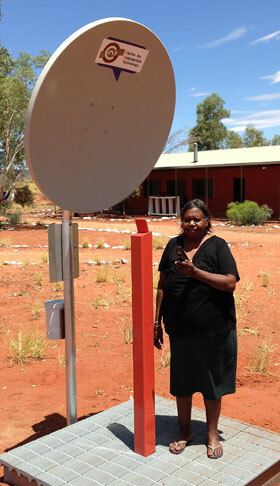 Aboriginal people in the CAT Enterprise workshop fabricate and install it. PHOTO (courtesy Central Land Council): One of the traditional owners, Kunmanara Ungwanaka, using the Hotspot in front of the art Centre at Red Sand Hill Outstation near the Boggy Hole track, Finke Gorge National Park. We need similar on Groote. Can someone please contact me by email and I will return call. Thanks. OK Andrew. It works! Now we want one for Yuelamu, Aileron and Wilora (Stirling Station). Just putting in an order before every other bugger gets on the band wagon.